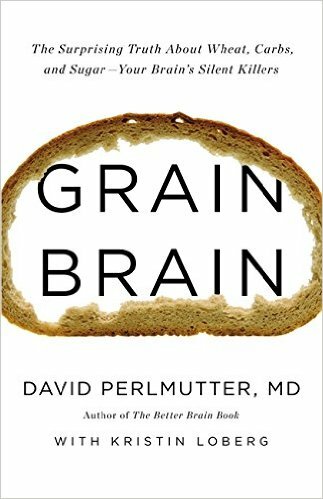 Grain Brain Review: Lose Weight by Nourishing The Mind. Grain Brain is not just another diet plan which demonizes wheat and grains as being harmful and eliminating them to lose weight, but it also gives a lot of science to suggest that when you correctly feed the mind with proper foods, you will improve mental health and at the same time burn calories and this review will explain which foods you need to eat and avoid. The biggest goal in the book is to help readers see how important it is to take care of your brain health because it is the tool which can lead to a longer life. David Pulmutter, the author makes a very strong case for this by explaining how most people do not even think about their mind as being something they need to take care of. Their bodies yes, but he mentions that the mind is one of the most important organs to help flourish because many problems such as obesity, heart disease also greatly increase chances of deadly, deteriorating diseases like Alzheimer’s and other neurological disorders which usually strike elderly people. If you can properly take care of your mind, you won’t just reduce the risk for having neurological problems, but because they are connected with general problems such as being overweight, you will also be able to treat that. In this diet plan, the same foods and lifestyle changes that are suggested feed the brain and also help get rid of fat. However, I never saw any average results listed however, you can lose a lot of weight by following this plan. How does the Grain Brain diet specifically work? If any food, drink or lifestyle you have harms the brain, you need to eliminate that from your life right away. They may be causing your brain to become damaged which can cause headaches and if not handled, more major problems. And the same things that damage the brain also damage the body, making it more fat and unhealthy. So obviously treating the brain also treats the body. Paleo. This plan is very close to a paleo style in that you eat a lot of vegetables and proteins from eggs. However, where paleo would endorse eating any kinds of fruits, Grain Brain does not allow for a lot of them because they can contain a lot of carbs. Carbs and grains are basically the enemy of brain health if you consume too many of them. In the book, David points to the paleolithic age people and shows a picture where most of their diet was eating fat and some protein, while the least was carbs since it was difficult to find. He also showed a picture of people today whose diet is very different from that and their main consumption is carbs. He draws the connection that because we eat so many carbs, that this has led to increases in weight and diseases. High fat doesn’t mean saturated fats. There are very healthy fats which do not ironically make you gain weight and you will get a list of them. Another diet (3 Week Diet) also proves you can lose weight doing this. Gluten free. There are a lot foods that contain wheat and grain and many of them also have gluten, which David Pulmutter is also a major enemy of having a healthy mind. There are a lot of stories David talks about where he helped patients (A child, middle aged people and elderly peopl) get rid of huge issues like ADHD, insomnia, ED, irritability, headaches, and more by just making these people change their diet. The diet helped get rid of the problems. He often mentions the term “gluten sensitivity” which he recommends people get a test for if they have a number of symptoms which the book will list. If you have those symptoms, you may have sensitivity to gluten in which case you need to eat foods free of that ingredient (gluten free diet). Ketogenic diet. David recommends calorie restriction and sometimes fasting as a means to help the body get into a ketogenic state where it will burn fat that will help brain health improve. David makes cholesterol sound like a good thing! Throughout the book, the theory of cholesterol being a horrible thing and it leading to blood clots and heart diseases is shut down by David. He says that a quarter of all cholesterol in the body is taken by the brain so cholesterol is important to consume if you’re going to have a healthy mind. And the theory that it leads to diseases is actually refuted and he says that other things people do such as smoking, drinking, eating unhealthy carbs and inflammation in the body is what can lead to those things, not cholesterol. He does talk about LDL and HDL but really says that eating fat such as from eggs is very important. I recently had a blood test which said my cholesterol levels were high. I am almost 30 and my total cholesterol was 229 where it should be under 199 to be normal. However, my HDL was 65 which is normal and my LDL was the one which was high (144 where 99 and under is normal) and after reading the Grain Brain, I am not worried about this. I have also been eating much less grains (no cereals, no bread). The only wheat I eat is organic wheat seeds but I do believe eating less grains makes you healthier. Week 1: You stop eating any non approved grains/wheat and start eating a lot of foods with fat, protein and vegetables. You are allowed to only have up to 40 grams of carbs a day. Supplements are also recommended included DHA which is omega 3. You can get them as pills, but you can also get them from fish. Week 2: David recommends you have some kind of exercise routine where you work out the majority of the week. Even walking is good for brain health. Week 3: You have to set a sleeping pattern which you follow all the time and get 7-8 hours at least. A good sleep is also very important for the health of the mind. Week 4: Everything you did for the 3 weeks are now added together and week 4 basically is a sample of the way you should live life after you end this week. Every week before added to the previous one and this one connects everything. Also there is a preparation before you start your plan where you are recommended to get a blood test and compare it after you finish the 4 weeks. Foods and oils with fats you can eat: Sesame oil, coconut oil and coconut, avocado, flax seed, chia seeds. Proteins: Poultry, eggs, oysters, sardines, clams, salmon, shrimp. Fruits (Low sugar only): lemons, eggplant, avocado. You can eat berries, but a sample menu recommends a small portion a day. Vegetables: Kale, garlic, spinach, ginger, bok choy, mushrooms. The sample menu in the book recommends eating 4 times a day. There was no number of calories allowed, but the sample look like it was under 2,000 calories a day. I think anyone who does this diet should follow the rules, but not torture themselves by being very restrictive. Eat based on BMR. In addition to this sample, there are many also recipes. Great plan for the brain and health! The Grain Brain is a plan that may suit 40 and above people better than it does younger people. If you are elderly or if you have ANY sensitivity to gluten and/or neurological problems, the Grain Brain may be exactly the best diet plan for you. I think this book and it’s recommendations are perfect for elderly people. If you’re young and just want to diet, this plan may be too radical and you should try the 3 week plan, a different diet that is excellent for weight loss and flexibility in eating, but you should also try to completely eliminate most grains out of your diet, even whole grains. Really interesting. This is a different approach and looks like it has a better approach than just calorie watching. I am losing a little weight each year by cutting down on carbs but I think I need to take some drastic action to get down to a healthy weight. This diet looks good. I can sustain something like this for 3 weeks. Phase 4 is really a “lifetime diet”, isn’t it? I am hoping that the diet will also clear the “foggy” feeling in my brain that I get from time to time. Hope it will also help my night time food cravings. I really appreciate a more scientific approach to losing weight that this book has. Thanks for the clear description. This diet is mainly a plan to try and get you to rethink eating carbs, so once you get used to it, the phase 4 portion isn’t going to be difficult to sustain, but I wouldn’t call the last part of it a lifetime plan. I’m sure from time t time, you can cheat a little bit, as long as your primary way of eating/dieting remains close to the main idea of this diet, you should be OK.
Vitaliy- Very interesting topic. This kind of thinking is starting to become more accepted now due to our understanding of how common grains are processed and utilized in our bodies. You know that if the cattle that we use for our meats eat grains are off limits then that should say something. I’m not completely sold on the cutting out of most fruits because of the types of carbs they contain but whatever works for the individual, right? Diet plans never cease to amaze me with what you can or can’t eat and this post was very eye opening. I think this diet would appeal to a lot of people, as it allows you to eat some foods that other diets would rule out completely. I also like the idea of eating to look after your mental health as in this case, prevention is most certainly better than a cure. This is a very interesting post. I never knew there is a diet for the care of your brain. What I found interesting is, I was always led to believe that cholesterol was bad for your health as the leading cause of heart disease and blood clots. I had no idea about this diet so I was intrigued right away when I came across your review. I do agree with this diet, actually. The general message is to eat clean high protein foods, low on the fruits, lots of healthy fats and greens. As a fitness person, I tend to follow this diet anyways and have had lots of luck. I would say it is working! I am very interested in learning more about this diet. I found this very interesting. I am always looking for a diet to incorporate in my weight loss journey. I noticed it’s for 40 and over; so is this a diet you implement once you’ve noticed you have brain issues? What if you are under 40 and notice neurological problems can you implement it? Will this be effective for children with ADHD? Hi Kisha, this diet is not just for people who started having neurological problems or are above a certain age, it’s good for most people and you shouldn’t wait until a health problem strikes to start eating in a way that combats it. Regarding ADHD, I really don’t have an answer for this. Hi Vitaly, This is a very nice article, I was absorbed by the reading! I have high cholesterol and I always thought that it comes from fat. This is the reason I stopped eating fat cheeses, eggs, butter,etc.. I think brown rice or whole rice might be allowed, but rarely Daniella. For your cholesterol, do a checkup to see which one is high, HDL or LDL. What you can eat for “safe” fats are the foods recommended in this book. If you eat those, you will be giving your brain and body the right nutrition. I switched to a similar diet to this about 2 months ago, a ketogenic diet. I’ve eliminated foods that make me feel sick (rice, bread, pasta) and now eat a high fat, low carb and moderate protein diet. The best diet choice I’ve ever made. Brain health is very important for me, the way I see it, if I eat for brain health the rest of the body will follow. I’m more switched on mentally, rarely get hungry, don’t have to watch or count calories, my acid reflux had gone and I’m sleeping better. Oh, and I lost 6.5 pounds in the first two weeks of eating this way. Thanks for the review, this is a book that I’m very interested in reading.